IS your child on the cusp of being a teenager? It's a time of big change. Not only does your child seem to grow before your eyes, you're likely to see their music tastes take shape, their eye for fashion develop, and their interests evolve as they seek new forms of self-expression. But this is a journey you can enjoy together, particularly when it comes to decorating their bedroom. Budget renovating expert Cherie Barber said taking a room from childhood themes to teenage dreams was a lot easier and cheaper than you would think. "The key is to look at what pieces you already have and how they can be reinterpreted - never underestimate the value in upcycling or the power of paint," Ms Barber said. 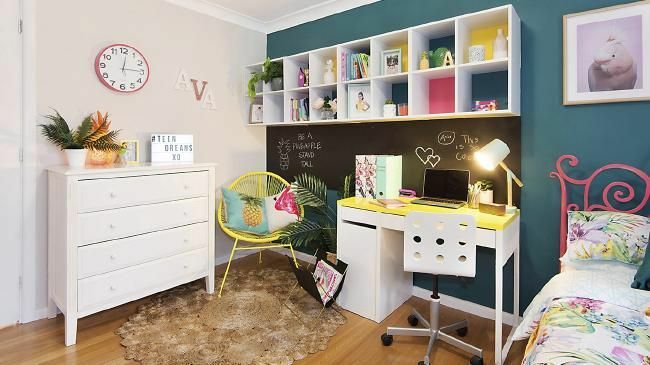 The celebrity renovating queen, who stars on Channel 10's The Living Room and is the founder of online education company Renovating For Profit, was recently tasked with transforming 11-year-old Ava's room from tween to teen. Using White Knight paints and some smart ideas, Ms Barber revamped Ava's room for under $500 and in just one day. Here, she shares some of her budget-friendly ideas. ... and how that corner used to look. We all know how much teenagers love their sleep! But, jokes aside, a good night's sleep is an essential part of their development. Ms Barber said, depending on the space you had to work with, and your budget, you might want to transition your child from their single bed to a king single or double bed. And don't necessarily think you have to go new. For Ava's room, Ms Barber opted for a double bed from a garage sale, spray-painting it fuchsia pink to tie in with the room's colourful new tropical theme. "Years ago, I would have painted something like this with a brush, which can be a problem because you sometimes see the brushstrokes, and it would take a few hours to dry between coats," Ms Barber said. "Using an aerosol spray is great because today they have the primer and paint in one - so, this bedhead was done in half an hour!" Think pink: a garage-sale bed is sprayed in fuchsia. Ava's old desk was upcycled by removing the hutch component to provide a more open feel. Ms Barber then spray-painted the desktop a bright yellow to give it a point of difference. "Using things that you already have in the space means it also won't feel completely foreign to them," she said. She added storage was important but cautioned against overcrowding the room with chunky pieces that took up valuable floor space. "Use your wall space - it is prime real estate in any room," she said. 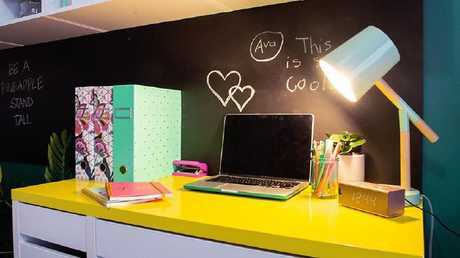 A bank of affordable storage cubes was wall mounted above Ava's desk. "It added another dimension to the room and also gave her somewhere to store favourite ornaments and books," Ms Barber said. The cubes came with a backing board, which Ms Barber painted different colours to tie in with the room's tropical palette. "This helped maintain some design continuity," she said. 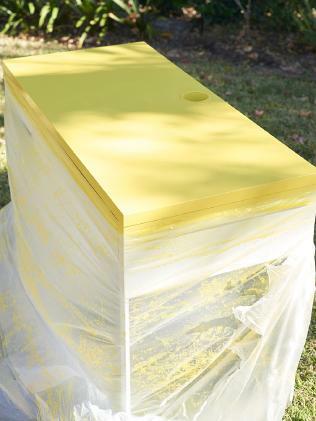 Hello yellow: the desk top gets a vivid new shade. Ms Barber said ideally you should include comfy seating and a rug in the room, so your teen and their friends had somewhere to relax. 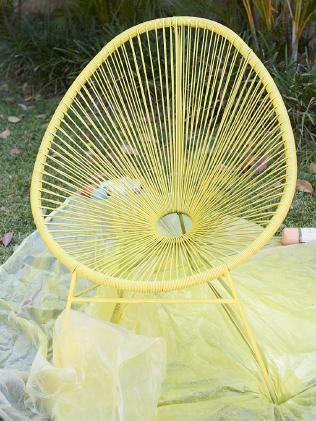 For Ava's room, she spray-painted an Acapulco-style plastic chair bright yellow and added a floor rug. "Spray-painting the chair literally took me a couple of minutes and it added so much personality," she said. A fun message board near Ava's desk was created using a piece of melamine, which was cut to size and painted in two coats of chalkboard paint. "When friends come over, they can write cute messages on the board. 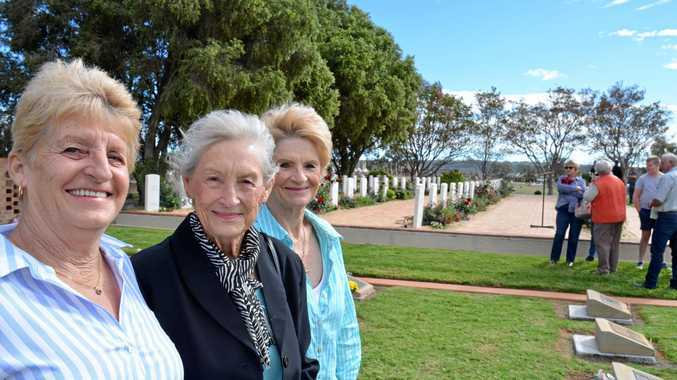 It's also a good spot to write little reminders, teaching organisational skills," Ms Barber said. "The very first thing Ava wrote on the board when she saw her room was, 'This is so cool!'" Yellow paint was used for the chair. 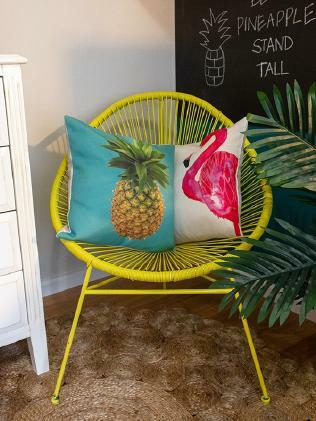 The bright shade ties in beautifully with the tropical theme. • Consult your child. Remember, it's their space so it should be about what they like and want. • Choose a theme and build your colour palette and decor (such as bed linen, artwork and cushions) around that. • Plan the room. Research exactly what you'll need, to avoid a hotchpotch result. It will also stop you from impulse buying. • Go for a neutral-coloured rug if you have a lot of colour in the room. It will help ground the look. • Use a stencil to paint simple motifs that match the room's theme and dress up plain wardrobe doors. 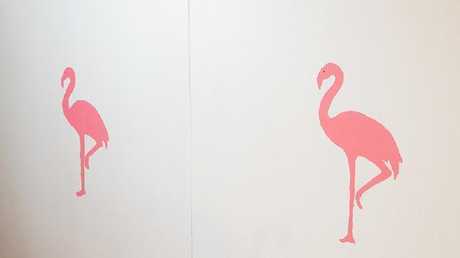 Ms Barber uses a flamingo stencil on wardrobe doors. ... and how that part of the bedroom looked pre-makeover. The yellow adds contrast to the blackboard paint. The effect is pretty and fun.